These instructions outline the installation of the Sarga Floor-Loops. These hardware accessories are available at Sarga Bodywork's online Graduate Store. The Sarga Floor Loops are intended for use with portable massage table that can be collapsed into a flat position on the floor. This application is most easily installed on wooden-framed tables. For video instruction of this installation, please refer to the Sarga Graduate Facebook Group. 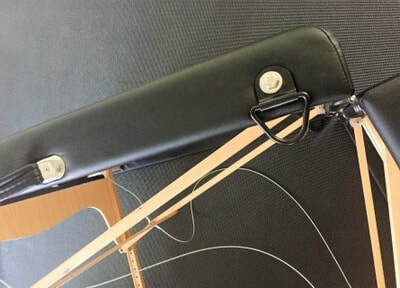 Altering your massage table in any of the ways detailed below may void any equipment warranty or liability coverage associated with your massage table. 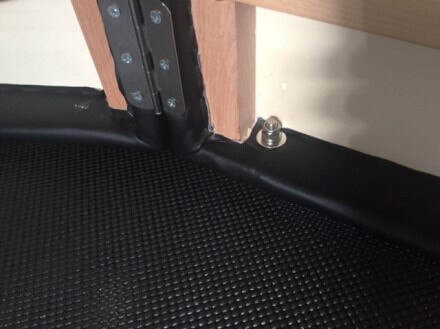 Sarga Bodywork assumes no responsibility for improper installation of the Sarga Floor-Loops or structural weakness caused to your massage table as a result of the proper or improper installation of this hardware. While Sarga Bodywork has had years of experience using and installing the Sarga Floor-Loops and believes it to be a safe and secure application, by continuing to follow the information provided here, you, the consumer, agree to assume all risk in the installation and usage of these hardware items, for both home and/or professional use. 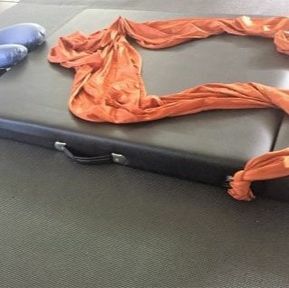 Sarga Bodywork only sells its proprietary equipment to graduates of its live courses, who have undergone proper training in the safety and use of this equipment. As a student of a Sarga Bodywork course you have agreed to assume all risk and liability in the use of this equipment, however if you disagree in any way with the information provided here, or do not want to assume full responsibility for the proper installation and usage of Sarga Bodywork's equipment, you must not proceed with these instructional directives. As always, you and your clients’ safety are primary! Please have your Sarga Floor-Loops installed by a professional. Your safety, the integrity of your massage table, and your clients' safety depend on it! Any weak points in the installation of these hardware accessories would likely be a result of how the loops are installed, i.e. using the proper tools and securing the hardware adequately. Our best advice is to communicate what they will be used for to the professional who will be installing your loops and to verify that he/she believes it to be a safe and secure application. 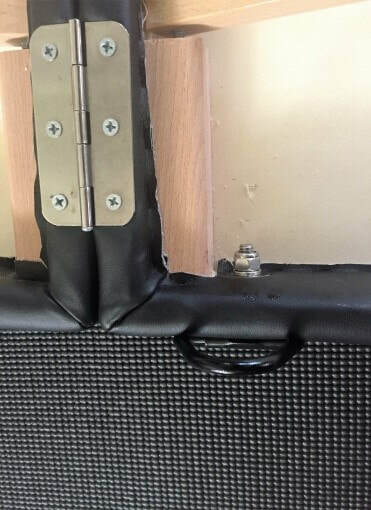 After installation, be sure to routinely check your hardware (like climbers check their gear), to make sure that nothing has loosened with use. Disengage one end of both long horizontal undercarriage cables. Or if you will be using this table exclusively for floor-based bodywork, you can remove your massage table's legs completely! 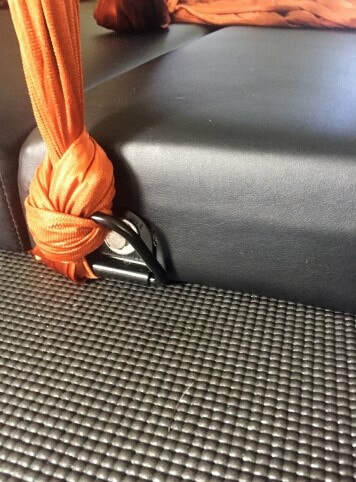 Portable massage tables often have “Shiatsu-Release-Cables” (i.e. the ability to release one end of both long horizontal undercarriage cables via a wingnut). However, even if your table does not have “Shiatsu-Release-Cables” or wingnuts at one end of both long horizontal undercarriage cables, you can still use tools to disengage one end of both cables. Tools needed: crescent wrench and possibly a screwdriver, depending on your table’s hardware. Once your massage table can be laid flat on the floor, you will need to drill one hole on either side of your portable massage table’s frame. These holes should be drilled as close to the central hinge as possible, on the face cradle half of your table. Begin with your massage table positioned on its side. Take one of your Floor-Loops and position it on the outer side of your massage table’s frame where you would like to drill your hole. Align the flat part of the metal with the bottom of your table’s frame. Make sure that there are no obstructions on the inner side (undercarriage side) of your hole and that there is sufficient room for a washer and nut to be fastened. Take a pen and mark the center of the hole on the vinyl (outer side) of your massage table’s frame. Repeat on the opposite side. Use a 1/8” drill bit to drill a pilot hole through your table’s frame at your pen mark, but first operate the drill in reverse until it punctures a hole through the vinyl upholstery. By doing this, you avoid getting the vinyl torn up in your drill bit when drilling forward. Recheck the inner side of your table to make sure that this hole is properly placed. Follow your pilot hole with a 5/16" drill bit in the same fashion, first in reverse, then forward. Tools needed: marker, drill, 1/8” drill bit, 5/16” drill bit. Now that you have your 2 holes drilled, you are ready to install your Floor-Loops. Take one of the bolts and insert it through a washer before inserting it through the metal plate of your Floor-Loop. This trio of parts can then be inserted into the outer side of one of the holes you just drilled. 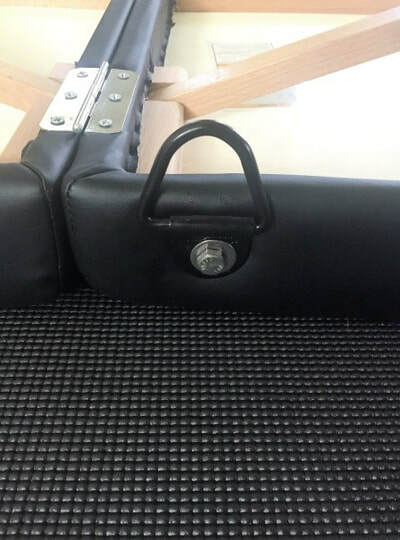 Make sure the flat edge of the metal plate is facing the bottom edge of your massage table’s frame. Then on the inner side of your massage table, place another large washer, then the smaller (lock) washer, and the nut. Use a wrench to tighten the metal nut. Make sure to tighten the nut enough so that the metal plate does not rotate at all. Order of the hardware pieces (from outer side to inner side of the massage table frame): bolt, large washer, Floor Loop metal plate, massage table frame, large washer, small lock washer, nut. Tools needed: two crescent wrenches.